Slowly slowly, form follows funding. — Clay Shirky, Newspapers, Paywalls, and Core Users, January 4, 2012. [In the publishing business] the readers are the product, and the customers are the advertisers. — Dave Winer, Scripting News, December 29,2011. The biggest surprise for any new president is the strain placed upon the “decision-making muscle,” since the choices that come upon him every day are precisely those the rest of the government has not been able to resolve. — James Fallow, Obama Explained, The Atlantic, March 2012. 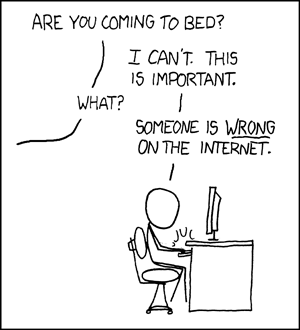 Classic internet cartoon from xkcd.